It was not until next to the last great day that Mrs. Shelby made the discovery they had overlooked a certain gold-cake, whose recipe was missing. "And I don't suppose it's to be found anywhere in the Valley," she mourned, "unless they've kept Phronie Moore's old cook-book. She was one of my bridesmaids, and she made it with her own hands. It was one of her own special recipes that she was noted for, and I wouldn't have lost it for anything." "You know the judge must have kept it, Alicia," the old doctor gently insisted. "You know the slightest thing she ever handled was sacred to him, and it stands to reason that anything she'd taken so much pride in, and written every page with her own hands, as you say, would be preserved. No doubt his daughter-in-law can find it for you without the least trouble." "Even if she could I wouldn't want to borrow it," began Mrs. Shelby, but Lloyd interrupted briskly. "I'll fix it all right for you, Aunt Alicia. I'll run right ovah to Oaklea as soon as Daphne gets this in the oven, and ask Mrs. Moore to let me copy the recipe for you." Just as the fictional Judge Moore attended the Pewee Valley Presbyterian Church, Judge Muir was also a member, and according to "The United Presbyterian Church in Pewee Valley 1866-1966 100th Anniversary" booklet, taught Sunday school there. In addition, his sister, Mrs. Magruder, taught school in the clapboard structure next to the church, which later served as a manse from 1884 to 1907. A profile of Judge Muir from the 1897 edition of “Lawyers and Lawmakers of Kentucky,” by H. Levin, editor , published by Lewis Publishing Company in Chicago, shows other parallels between the real-life Judge Muir and the fictional Judge Moore. For example, he was indeed a widower at the time the “Little Colonel” stories were written and his late wife’s name was Sophronia. She is referred to as “Phronie” in the books. Sophronia died in 1885, leaving seven children: Belle (short for Isabelle), married on June 27, 1867 to Harry Weissinger, a tobacco manufacturer of Louisville (who became the Old Colonel); Thomas R.; Sidney S.; Upton W.; Lillian, wife of A. A. Semple of Louisville (and the mother of Muir Semple, the real-life model for Rob Moore); Nellie, wife of A. H. Smith, of Springfield, Illinois, and Sophronia. "Posh old Rob," answered Lloyd, swallowing another yawn. "His fathah died a little ovah a yeah ago, and he's nevah been like himself since. He seemed to grow into a man in just a few hours. It was awfully sudden --- Mistah Moore's death. The shock neahly killed Rob's mothah, and the deah old judge, his grandfathah, you know, was simply heartbroken. Rob just gave up his entire time to them aftah that. He was such a comfort. Nevah left the place, and took charge of all the business mattahs, to spare them every worry. When things were settled up they found there wasn't as much left as they had thought there would be, and Rob wouldn't touch a cent to finish his law course. He was afraid his mothah would have to deny herself some luxury she had always been used to, and he didn't want her to miss a single one she had had in his fathah's lifetime. So he took a position in Louisville, and has been working like a dawg evah since. He reads law at night with the old judge, so I scarcely evah see him. We've just drifted apart, till it seems as if the little old Bobby I grew up with is dead and gone. I missed him dreadfully at first, all last summah, for he'd almost lived at our house, and was just hike a brothah. I haven't seen him at all this vacation, though to be suah I've only been home this one day." …Over at Oaklea, Rob sat scowling at a book spread out before him on the library table, He was thinking of Harcourt as he had seen him on the front seat beside Lloyd, in his cool-looking white flannels, the very embodiment of gentlemanley leisure. No doubt she noticed the contrast between them, he all dusty and dishevelled from his day's work and the trip home on the hot car. Not that he would change places, not that he regretted for an instant the part he had to take in the grimy working world. But the chance encounter had suddenly opened his eyes to all that he had had to sacrifice for that work. Until now it had not even left him time to realize how much he had given up. Now to find this stranger enjoying all that was once his stung him to envy. He smiled grimly as he recognized it as envy. He had thought himself free from such a childish trait. But he could not smile away the feeling. It persisted till it accomplished more than the old judge's advice and his mother's pleadings, that all work and no play was bad for him. Closing his book he announced his intention of walking over to The Locusts. … Peter B. Muir, was …left an orphan at an early age, and forced to begin life's battle for himself. His early education was such as could be procured in the country schools of Nelson county, but chiefly was he indebted to the care and supervision of his paternal grandfather, Dr. William Muir, for the advantages he had in youth. The struggle was often a hard one but the courageous spirit of the young man enable him to triumph over difficulties and he finally accumulated sufficient means wherewith to pay his tuition during a two-years course in Hanover College. He returned home with an ambition to become a member of the legal profession and took up the study of law, reading alone, through the hours usually called "leisure." 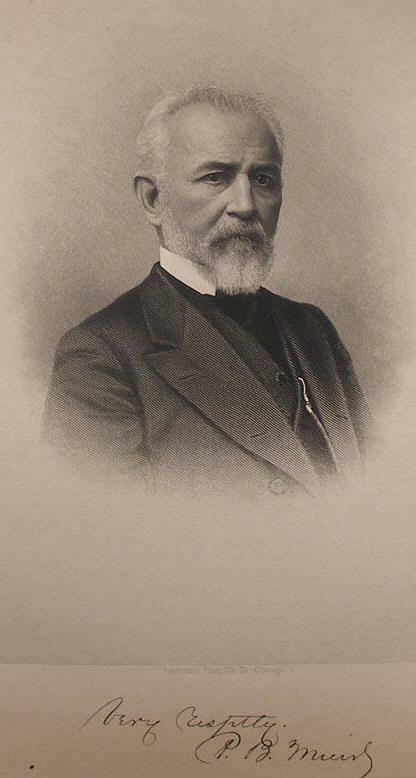 When he had saved from his earnings the sum of one hundred dollars he invested in law books, purchasing the library of Judge J. D. Nourse, of Bardstown. MUIR --- Judge P.B. Muir, in his ninetieth year, Friday morning, November 3, 1911, at his residence in Pewee Valley. Funeral fromWarren Memorial Presbyterian Church, Fourth and Broadway, Sunday afternoon at 3:30 o'clock. Interment private. First: -- Except as herein expressly stated, I release each and all of my children from all demands I may have against them, and direct that none of them be charged in the settlement of my estate for money loaned, befits conferred or advancements made at any time by me. Second: -- I devise to my son, Thomas R. Muir, in fee simple so much of my farms in Spencer county, Kentucky, as is described by mates and bonds in the following deeds, to-with: -- 1st, The deed from Lewis Long, Special Commissioner, to me, Dated November 6, 1882, containing two hundred and twenty four (224) acres and thirty (30) pole, and known as the “Long Farm,” and formerly known as the “Beauchamp farm.” 2nd, the deed to me from William McKinley, and his wife, dated May 16th, 1885 containing one and twelve one hundredths (1.21) acres, and 3rd, the deed to thirty four and seven one hundredths (34.7) acres also conveyed to me on May 8th, 1890 by Yoder Poignard as Commissioner. The three parcels of land aforesaid containing three hundred and nine (309) acres and containing the residence in which my said son has resided, with my permission, for many years, without charge or rent. Third: -- I revise to my son, Sidney S. Muir, in fee simple, my two farms in Spencer County, Kentucky, adjoining the land above devised to my son, Thomas R. Muir, the said farms adjoin and together contain about three hundred twenty five (325) acres. One of them known as the “Johnson farm” was conveyed to me by Jonathan Van Dyke, by deed dated January 1, 1890, and contains about one hundred and fifteen acres (115), and the other known as the “McKinley farm” was conveyed to me by D.B. McKinley etc. by deed dated March 8, 1909, and contains about two hundred ten (210) acres. The McKinley farm was conveyed to me in 1907 and is in bad repair. My executor is hereby directed, out of my estate, to expend one thousand dollars ($1,000) in fencing and otherwise repairing said farms. Fourth: -- I give and bequeath to my four daughters, Belle Weissinger, Lillian M. Semple, Nellie Smith and Sophronia Penick, my entire set of rosewood furniture, to be equally divided between them. I bought the elegant set of furniture to please their beloved mother nearly fifty years ago, and request my daughters never to part with any of it. No charge is to be made against either of them for this furniture. Fifth: -- My executor is directed to hereby expend upon my lot in Cave Hill Cemetery a sum not exceeding fifteen hundred dollars ($1,500). The sum aforesaid shall be expended when and as directed by my daughters, or by any three of them. Sixth: -- I give, devise and bequeath all the rest and residue of my estate, real, personal and mixed, in fee simple to my daughter, Bella Weissinger, one fifth; to my daughter, Lillian M. Semple, one fifth, (subject to a charge of fifteen hundred dollars ($1,500) for my place, Scotia, in Pewee Valley, which I conveyed to her); to my daughter Nellie Smith, one fifth; to my daughter, Sephronia Penick, one fifth. The remaining fifth I devise and bequeath … in trust for the use and benefit of my two grandchildren, Elizabeth and Peter, only children of my deceased son, Upton W. Muir. When my grandson Peter, attains majority, the trust is to terminate and the trustee is directed to pay one equal half of the said trust fund to each of said children. If either of them should die before termination of the trust, as aforesaid, the whole shall be paid to the survivor. If both of them should die before Peter attains majority, the trust shall terminate, and the entire trust shall be paid, per stirpes, to my heirs. Seventh: -- My executor hereinafter named is hereby empowered and directed to sell and convey all my real estate in the City of Louisville, and my residence in Pewee Valley, at public or private sale, in its discretion, and on reasonable terms. But no sale of my real estate shall be made without the concurrence and written approval of my son-in-law, Harry Weissinger. Eighth: -- I hereby appoint the Fidelity Trust Company, of Louisville, Kentucky, executor of this, my last will and testament. As compensation for its services, I allow the Fidelity Trust Company one thousand dollars ($1,000). As I expect to be practically out of debt at my death, I direct that no inventory of my estate, or appraisement thereof be made, nor do I wish any settlement in any Court or before any commissioner or officer to be made by my executor. My children can, and in deference to my wishes, I feel sure that they will make a fair and amicable settlement and division of my estate according to this my last will, and I earnestly request them to do so. My executor will not need the services of legal counsel and therefore I direct that none shall be employed. Witness my hand this 31st day of December, 1910. In a codicil dated April 19, 1911, he changed his executor from the Fidelity Trust Company to the Columbia Trust Company. Note that serving as witnesses to the codicil were William N. Jurey and James J. Foley, who owned competing stores across from the train depot in Pewee Valley. The will raises a question: where was Judge Muir’s “place, Scotia, in Pewee Valley” that he conveyed to his daughter, Lillian Semple, mother of Muir Semple, who was Annie Fellows Johnston’s model for Rob Moore in the “Little Colonel” stories. Later in the will, he directs that his “residence in Pewee Valley,” Oaklea, be sold. According to the 1879 Pewee Valley map, he owned two other parcels of land along Tulip and may have acquired more by the time of his death. ***Many thanks to Kurt X. Metzmeier, Associate Director, Louis D. Brandeis School of Law Library, University of Louisville for the picture and “Lawyers and Lawmakers” profile of Judge Muir.